I am excited to present you the first blog post in the Make It Wear It series! Angelica chose to make the Anza. The Anza pattern comes in both jumpsuit and dress options, and Angelica made the jumpsuit option. I think styling the Anza jumpsuit is both easy and difficult. The easy part is that because it’s an overall, so you really can just put it on and go. You don’t actually have to wear anything else with it. The difficult part is to add other elements and accessories to spice it up. I think Angelica is doing a great job showing us the nuances. Special thanks to our fabric sponsor! Be sure to use CAPS; the code is case sensitive. Discount is good from April 1st, 2019, 00:00 EST thru April 6, 2019, 23:59 pm EST. Cannot be combined with any other discount, but CAN be used with the automatically applied $6.99 US flat rate shipping! Without further ado, here’s Angelica! Today I am sharing 3 different ways to wear the Anza Jumpsuit! I absolutely loved sewing it up and want to give a huge shoutout to Sly Fox Fabrics for sponsoring the beautiful Navy Crepon fabric that my jumpsuit is made out of. I knew immediately that I wanted to make a navy jumpsuit, and Sly Fox Fabrics had exactly what I needed to make it come to life. Jumpsuits are one of my favorite garments to wear. They are SO comfy and easy to style – a closet staple for those days when you don’t have time to put together an outfit, but you still want to look put together. Anza styles REALLY well with a blazer and heels – the perfect office look! I styled mine with minimal jewelry and a tote bag. It’s also a very comfortable outfit for long days in the office. I equate the comfort of jumpsuits to pajamas. 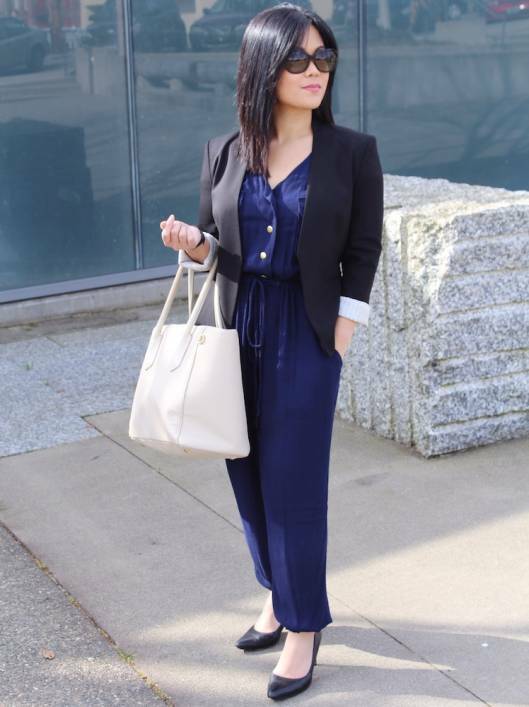 If you’re going to work a long day, jumpsuits are the way to go. At my day-job, I work as a supply chain analyst in an airplane factory. I can definitely appreciate this cozy jumpsuit while walking around the factory floor! The day that I finished my Anza Jumpsuit, my husband and I went out to dinner to celebrate our second wedding anniversary that same night. I didn’t have anything in my closet that I was excited to wear up until about 3:00 pm when I put the finishing touches on my jumpsuit. I decided to dress it up with the same heels and jewelry I wore for our wedding 2 years ago – my beloved purple Valentino Rockstud heels and a pair of blush statement earrings and dainty blush bracelet. Also, remember when I said Anza is excellent for long days? It’s the perfect work day to night outfit! Ditch the blazer from your hard day of work and add some statement jewelry for an easy transition. Last but not least, Anza works well dressed down for a day full of running errands and grabbing coffee with a friend on Sunday mornings. Ditch the heels and jewelry and pair it with flats and a crossbody bag. I look forward to seeing all the different ways you will style your Anza Jumpsuit or Dress! How do you see this jumpsuit fitting into your wardrobe? I can’t wait to hear! Interesting in following the Make It Wear It blog series? You can follow Itch to Stitch’s blog on Bloglovin’ or you can also sign up below to get the Itch to Stitch newsletter. Either way, you’ll be notified when the first issue of Make It Wear It is up. ← Introducing Blog Series—Make It Wear It! I definitely struggle with how to wear a jumpsuit. I might need to try again, now! Love all the different looks you achieved-it is so easy to get into a rut and wear garments the same way all the time- thanks for the inspiration-you look so lovely in all the versions! Thank you, Janet! I agree, it does take a bit of creativity to find different ways to style garments. Especially ones we make ourselves!